Workman Publishing Company, 9781563054679, 400pp. While it seeks neither to define Zen nor answer its most famous koan (a riddle unanswerable by conventional thinking, in this case the sound of one hand clapping), this bestselling little book with 437,000 copies in print possesses a maverick Zen spirit that points to a different way of looking at the world. With each page featuring a quote, phrase, story, koan, haiku, or poem, Zen Companion combines the feeling and format of a meditation book with 2,500 years of wisdom-from Lao-tzu and Groucho Marx, William Carlos Williams and The Little Prince, D. T. Suzuki and Walker Percy, the Buddha and the Bible, Einstein and Gertrude Stein. It's a celebration of intuition: "If a man wishes to be sure of the road he treads on, he must close his eyes and walk in the dark"-St. John the Cross. Individuality: "Do not seek to follow in the footsteps of the men of old; seek what they sought."-Basho. Uncomplicated nature: "Among twenty snowy mountains/The only moving thing/Was the eye of the blackbird. "-Wallace Stevens. Childlike spontaneity: "Goodnight stars. Goodnight air. "-Margaret Wise Brown. Irreverent paradox: "Wakuan complained when he saw a picture of bearded Bodhidharma: 'Why hasn't that fellow a beard?'" And above all, the simple pleasure of life lived in the moment. "Chop wood, carry water." 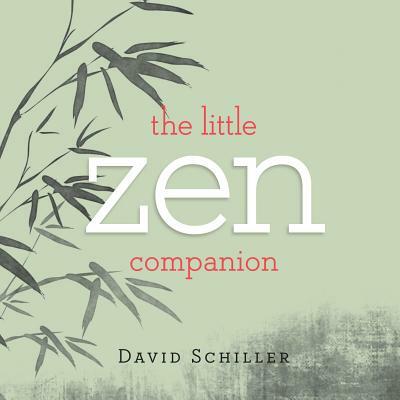 David Schiller is an author of eclectic interests whose books include The Little Zen Companion, The Little Book of Prayers, and Guitars, among others. His books and calendars have more than 2 million copies in print. He lives in New York.